​in Bishop at the Tri-County Fairgrounds. 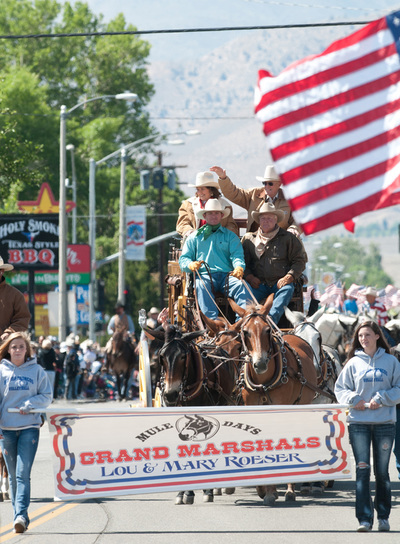 Lee Roeser, Board Member, has been selected to be inducted into the Mule Days Hall of Fame and Jennifer Roeser, Board member is the Program Chairman for 2019. 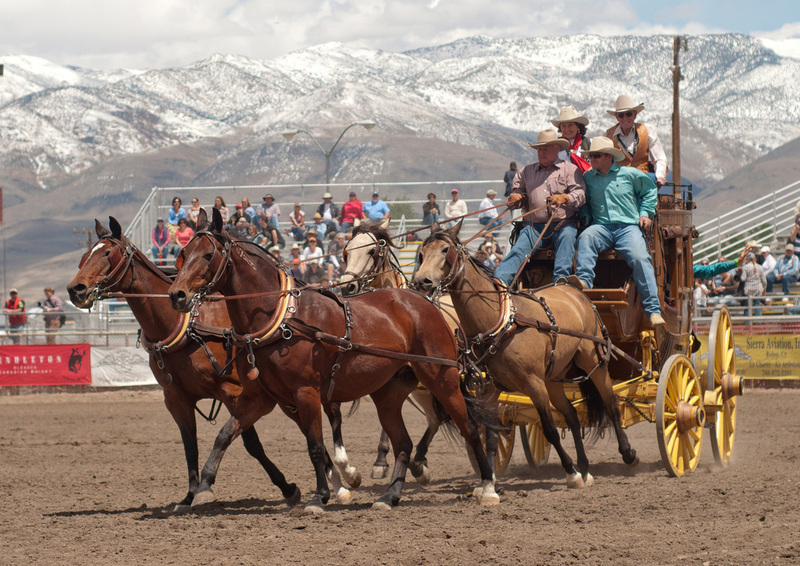 The event centers at the Tri-County Fairgrounds in Bishop, California. 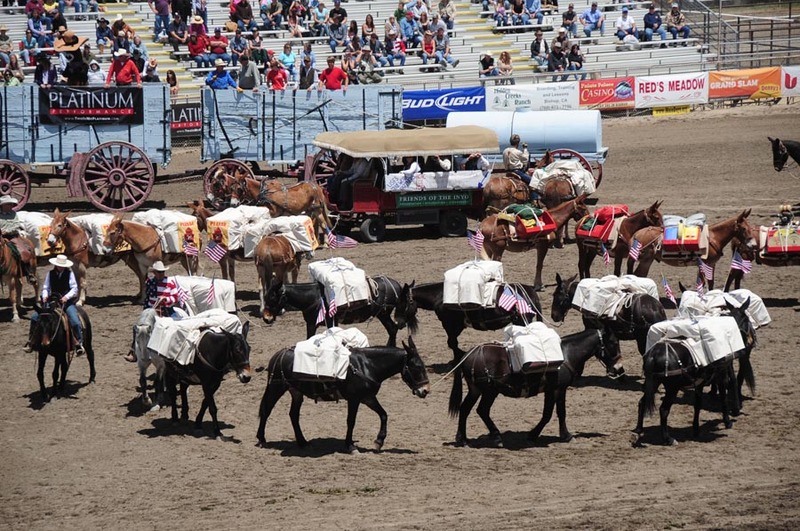 Enjoy all the exciting events, participate with your mules, attend the shows and concerts, bring your RV and camp on the Fairgrounds. For more information about Mule Days, go online to MuleDays.org or call their office. The American Mule Museum will have a booth at the main entrance kiosk. 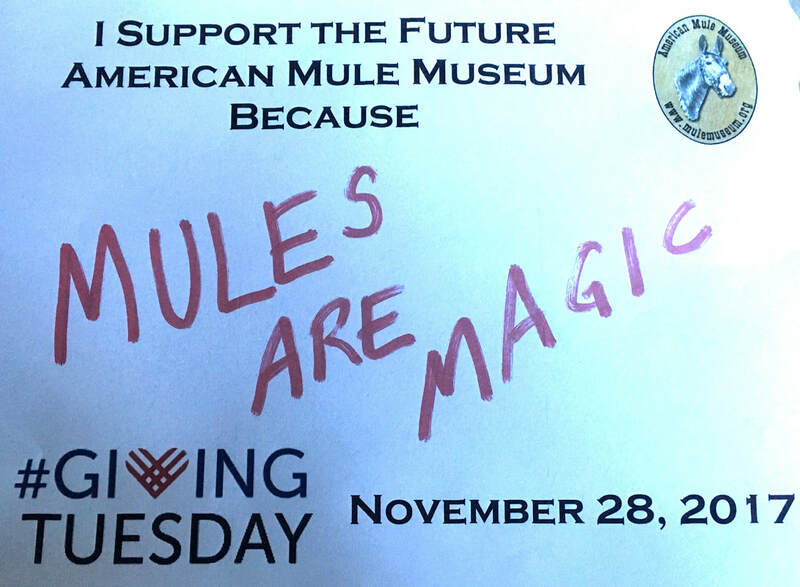 Join us there, meet other mule fans, exchange stories and become a Founding Member. Volunteer to "man" the booth for a shift. 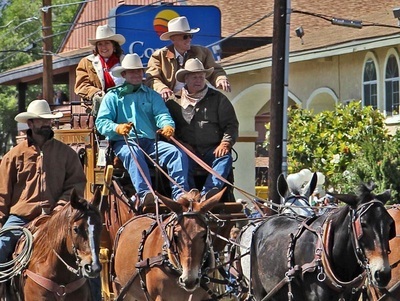 This Year of 2019, Bishop Mule Days will celebrate 50 years as the most exciting and largest Mule Show in the country. 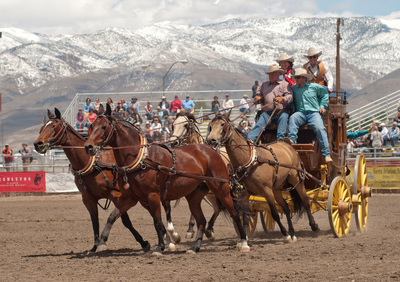 It is held at the Bishop Fairgrounds on May 22nd through May 26th, before the Memorial Day Holiday. 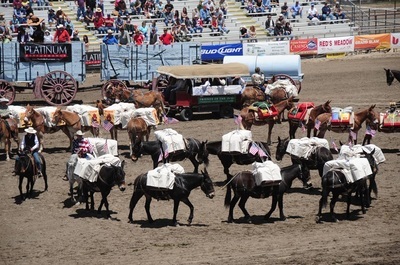 The American Mule Museum’s annual Silent Auction Fundraiser will again be held in the Douglas Robinson Building for 5 days during the competitions and arena shows. 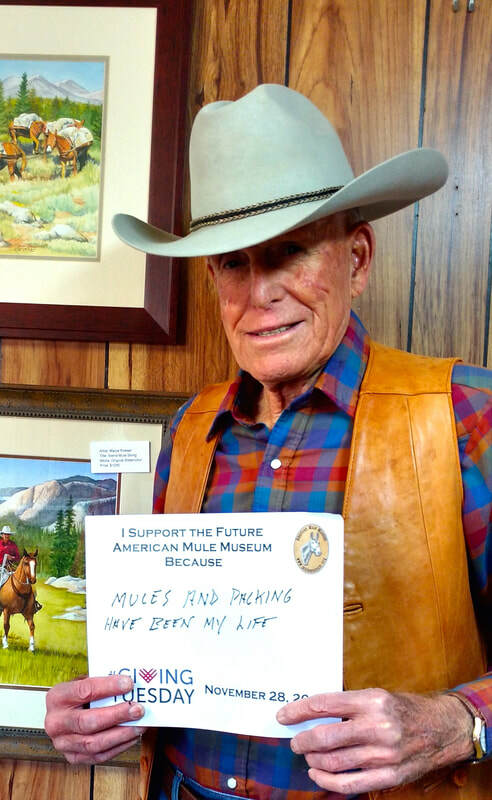 One of a kind auction pieces are showcased in the display area in the center and include items such as Western décor, art work, photography, old saddles, gear, books, collectibles and antiques, and of course, “all things Mule”. We welcome your donations or contributions. Bidders have 5 days to make their bids on desired items, beginning on Wednesday. Tables are set up with clipboards to accommodate the bids. There is always an amazing variety of many one of a kind selections available. The auction will open on Wednesday and run through 1 p.m. on Sunday. The last bids before 1 PM on Sunday are the winners! Payment for winning bid items by cash or check only. We look forward to seeing you and hope you are all winners! In addition to choosing your items to bid on, check out all the vendors in the buildings and grounds for their unique shopping opportunities. Many of them also donate items for the Auction. 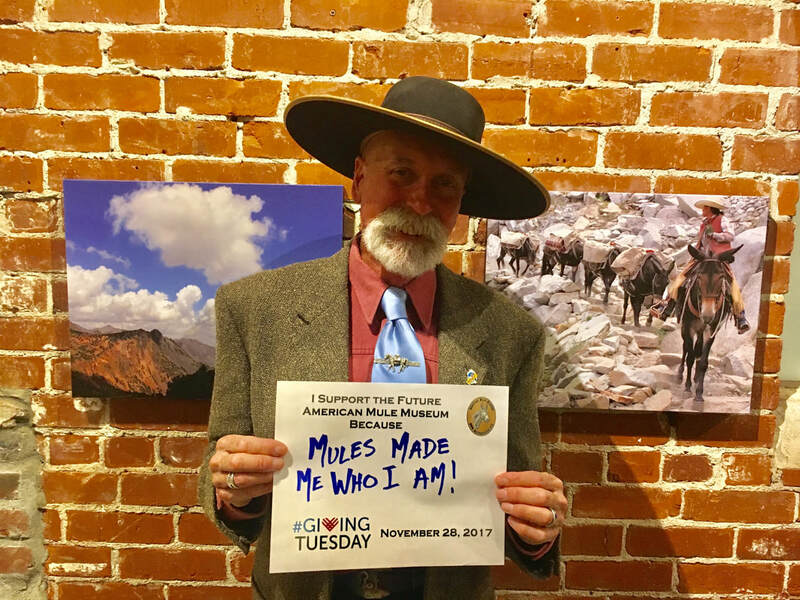 The dramatic, scenic Eastern California area has been called the “Mule Capital of the World” for over 50 years due to the existence of so many outstanding mules in the area. Projects the Museum Board and volunteers are working on currently include helping with the Mule Days Program articles and Mule Days events, panels and a life-size display of Sierra mule packing and mine packing in the New 20 Mule team Wagon Barn at the Laws Railroad Museum in Bishop, and new planned displays at the Western Film Museum in Lone Pine and the Eastern California Museum in Independence. 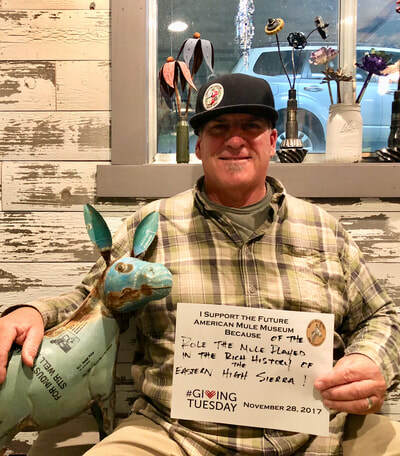 Your donations and contributions will help toward producing these exciting stories of the humble American Mule in the Sierra and Eastern California. If you have items that you wish to donate to the Auction, e-mail us with a photo and description of the piece on our website Contact Page – attention Silent Auction Chairman, Ruby Allen. Pieces can be delivered to the Douglas Robinson Building at the Fairgrounds on Tues., May 22, between 9 AM and 5 PM or Wed. morning at 9 AM. Special arrangements often can be made. If you can volunteer your time to assist, also please contact us. 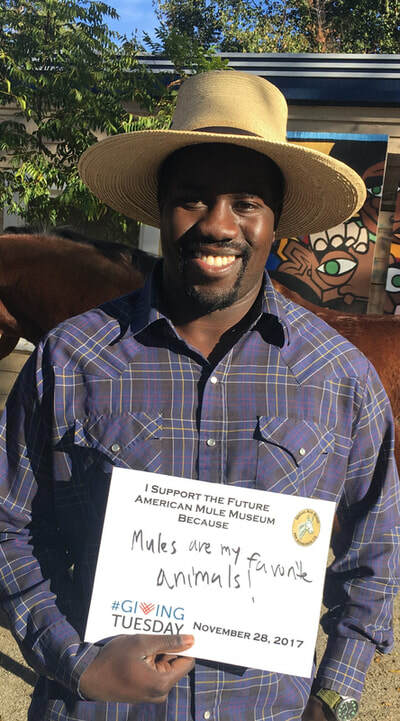 While on our website, sign up for our quarterly newsletter to stay informed and up-to-date on Museum activities. The American Mule Museum would like to take the time to feature one of our most generous donors and friend Meredith Hodges. 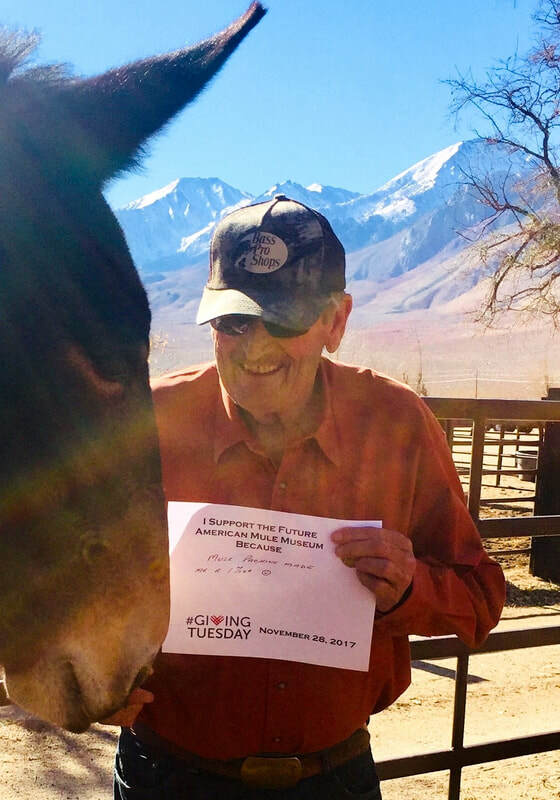 Meredith has done so much for the Mule community from her Lucky Three Ranch to her character Jasper the mule. We are proud and honored to have Meredith on our team. 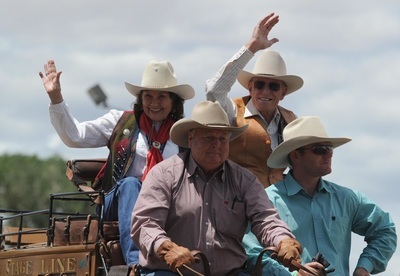 Meredith’s Bio Meredith Hodges was born in Minneapolis, Minnesota, the daughter of renowned cartoonist and “Peanuts” creator, Charles M. Schulz, and Windy Valley Mule Ranch founder, Joyce Doty. 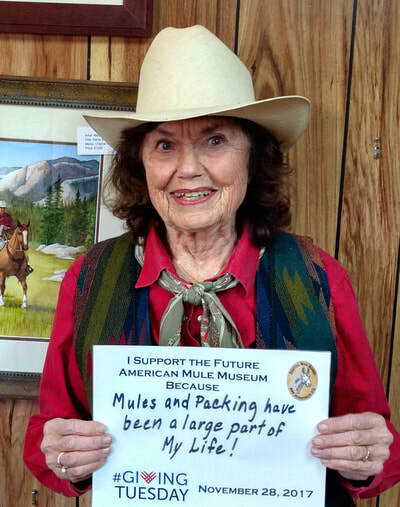 Meredith has been associated with horses all of her life, and with mules since 1973. 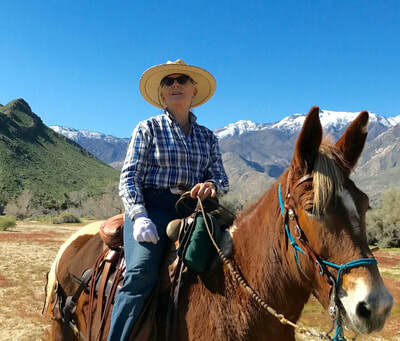 In 1980, Meredith moved to Loveland, Colorado, where she started the Lucky Three Mule Ranch, breeding and training a line of mules that were exceptional in their quality and athletic ability, and producing numerous world champions. 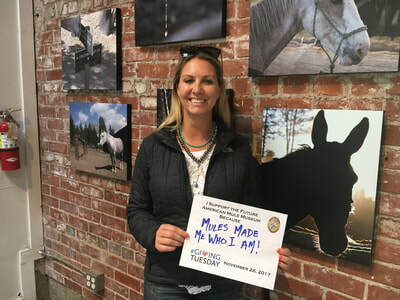 Meredith’s mules have competed successfully against horses in breed shows and in dressage and combined training, and she trained the first mule ever to reach fourth-level dressage. Meredith also trained the only formal jumping donkey in the world to date that was able to jump four feet in exhibition at Bishop Mule Days in 1991. 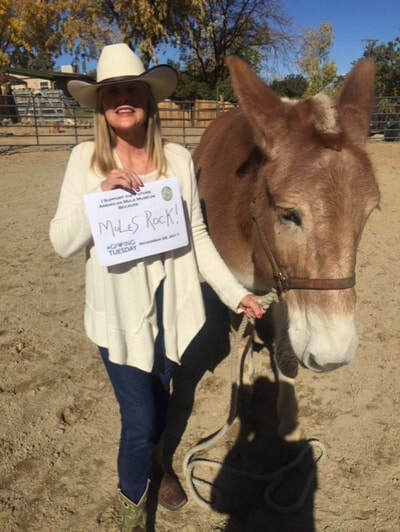 Meredith is a respected authority as a riding and training instructor, breeder and promoter of mules and donkeys. 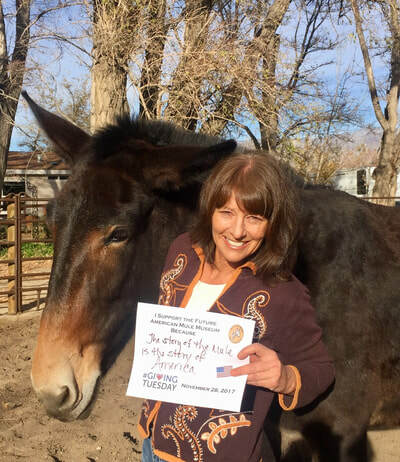 Since 1980, she has been an animal inspector, representative and judge for the American Donkey & Mule Society (America’s national mule and donkey organization). Since 1983, she has written the column, “Mule Crossing,” which has appeared in numerous equine publications both nationally and internationally, and has sparked renewed interest in mules and donkeys. 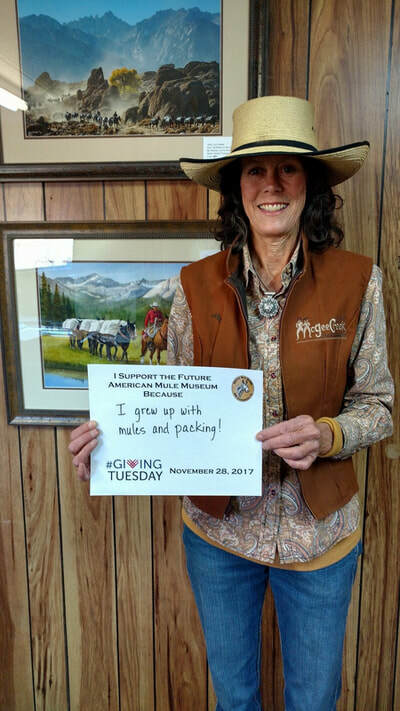 Meredith has studied horsemanship with some of the best: Major Anders Lindgren (Swedish Olympic team), Denny Emerson (US Olympic team), Bruce Davidson (US Olympic team), Jim Graham (US Olympic team), Richard Shrake (AQHA Congress judge & international instructor/trainer), Pat Parelli (Natural Horsemanship), and numerous others. Her mules have marched in the 1988 Tournament of Roses parade in Pasadena, California, and in the 53rd Presidential Inaugural parade in Washington, D.C. She was instrumental in getting mules accepted in Dressage by the United States Dressage Federation and by the United States Equestrian Federation. In 1990, while considering ideas for her “Mule Crossing” column, Meredith came up with the idea to write a letter from a little mule named Jasper who was abused and confused by humans and feature it in her column. She wrote the letter for her column to remind people that animals also have feelings that need to be considered. 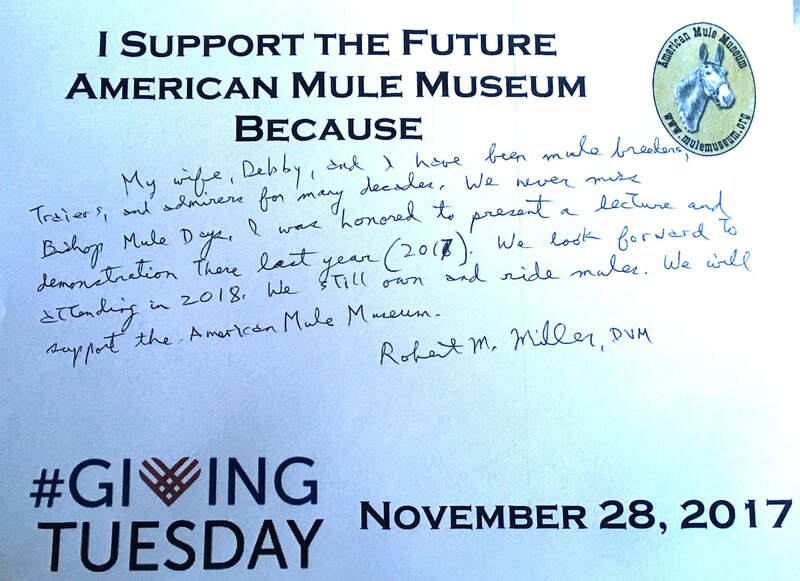 The letter proved to be a hit and, in honor of her father and inspired by her mother, Meredith went on to produce Jasper: The Story Of A Mule, which sparked a heartwarming series of books and DVDs that continues to captivate children, while introducing them to mules and donkeys in a favorable, educational and entertaining way. On the centenary of the opening of the Los Angeles Aqueduct, Lauren Bon and the Metabolic Studio will perform One Hundred Mules Walking the Los Angeles Aqueduct, a commemorative artist action to connect Los Angeles to its water source. 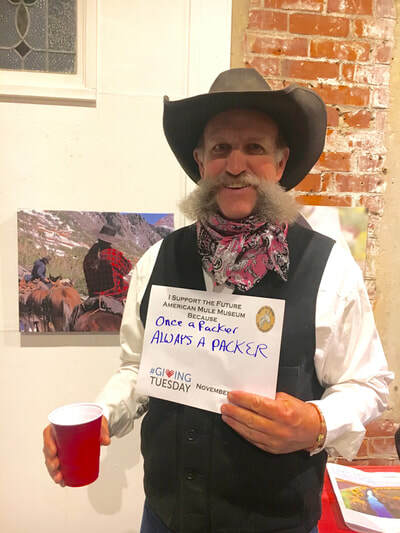 This performative parade of 100 mules will traverse the 240 miles of pipelines and canals that bring water from the Eastern Sierras through a gravity-fed system to Los Angeles, passing through three counties and nearly 50 communities along the way. Mule power shaped the modern West and was a primary force in constructing the aqueduct, an engineering feat that took only seven years to complete despite the rough terrain. The parade will take nearly a month, with public events planned in Bishop, Manzanar, the Owens Dry Lake Bed, Pine Canyon, Neenach, The Cascades, Hansen Dam, and Griffith Park. 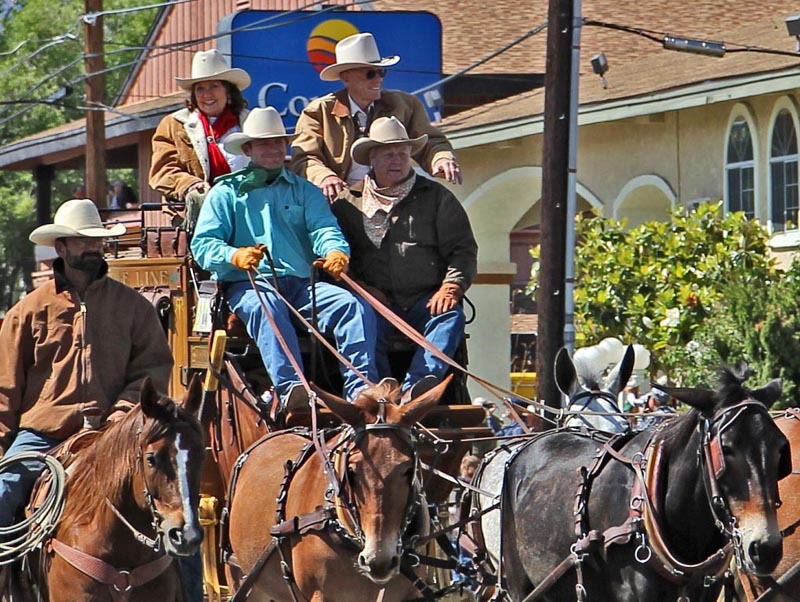 It will culminate in a Veterans Day Parade down Western Avenue in Glendale to welcome the mules into the City of Los Angeles on November 11, 2013, followed by a ceremony at the Equidome to celebrate our country’s equine labor force—the mule. 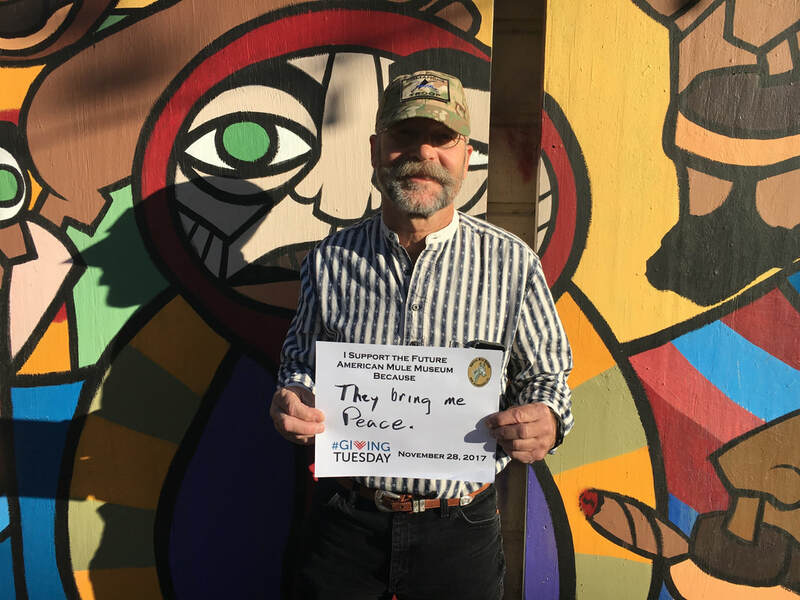 This commemorative action is a prelude to Bending the Los Angeles River Back into the City, a work that will pierce the concrete jacket of the Los Angeles River and use a sixty-foot waterwheel to reconnect the land to the river that originally supplied water to the city. 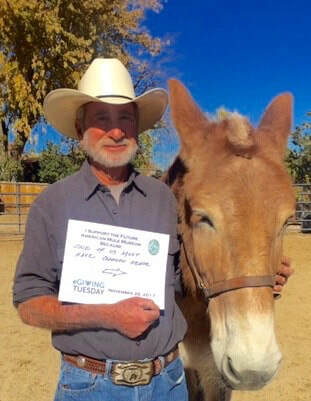 One Hundred Mules Walking the Los Angeles Aqueduct is an action with a resolution to move forward into the next hundred years with renewed appreciation for this vital resource: Let it be resolved that the citizens of Los Angeles will do better at utilizing this life-giving resource in the next one hundred years! 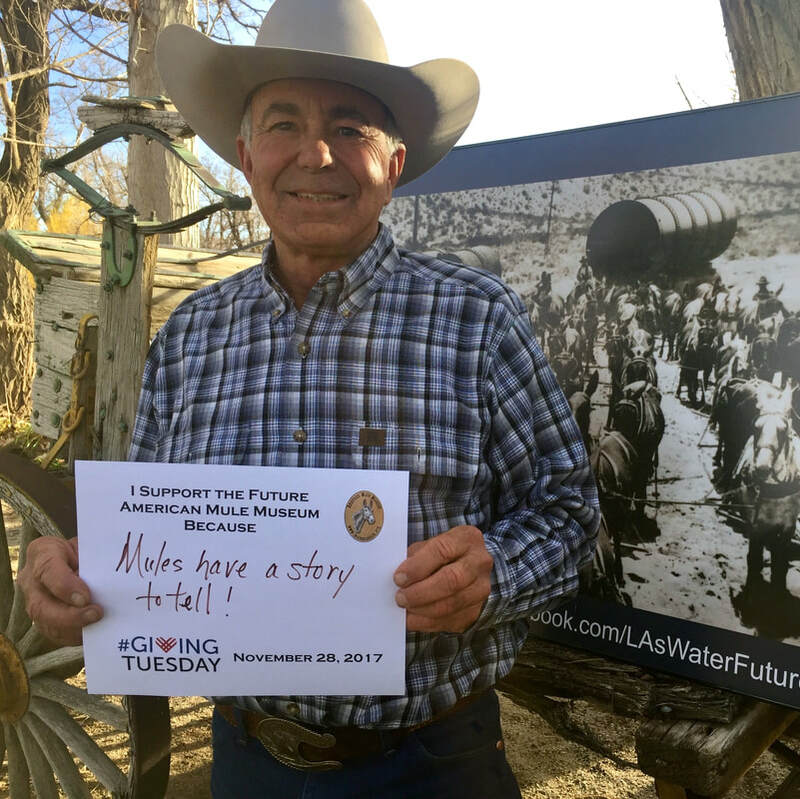 This action is coordinated with the support of the Los Angeles Department of Water and Power (LADWP) that has itself been working to make a new century of water delivery happen. About the Metabolic Studio: The Metabolic Studio was formed in 2009 to support the signature projects of Lauren Bon’s artistic practice. 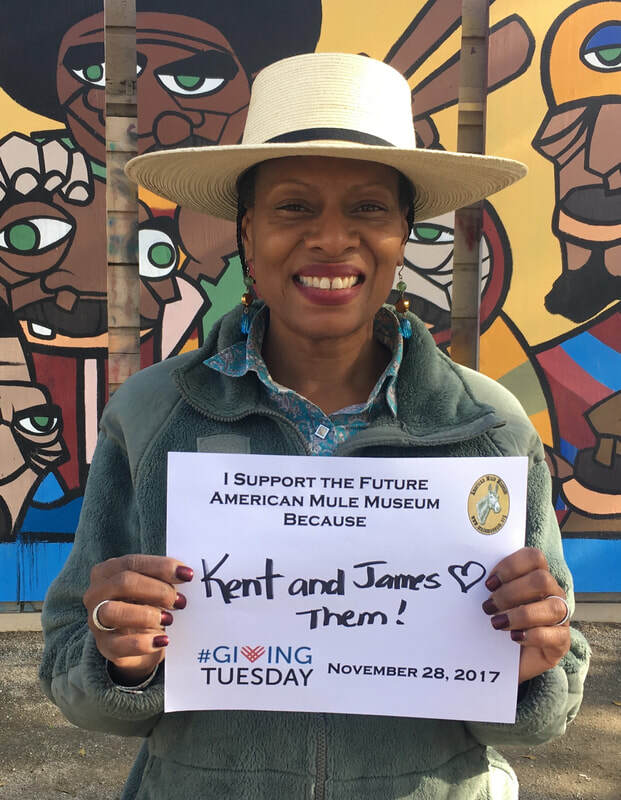 The studio team also directs philanthropic support to the people, places, and projects that underpin the long-term goals of Ms. Bon’s work. For additional information, contact Michele Urton at press@metabolicstudio.org or 213-300-6775. We here at the American Mule Museum encourage you to get connected with the museum's social media. 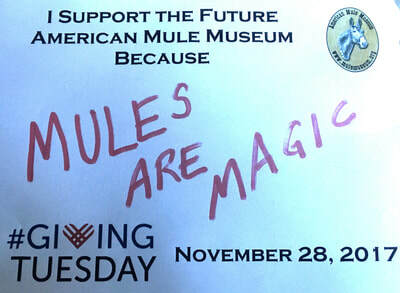 Check us out on the web at www.mulemuseum.org and don’t forget to friend us on facebook. Just search for American Mule Museum. 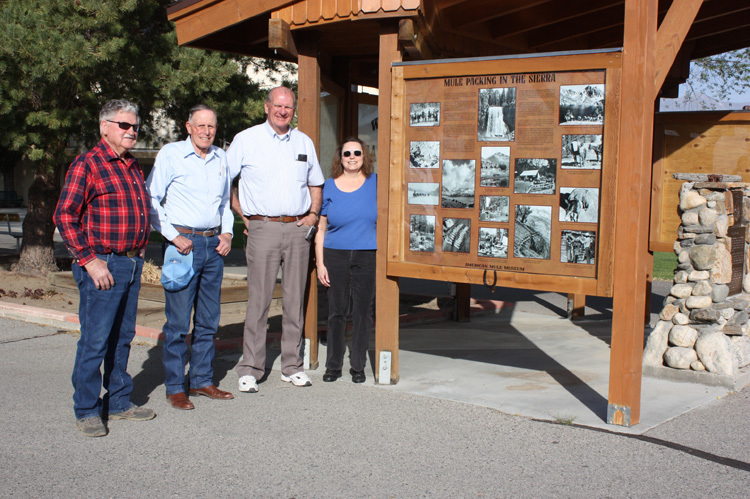 The American Mule Museum constructed a new addition to the main entrance kiosk at the Fairgrounds in time for Mule Days in 2011. Nine fascinating panels illustrating the use of mules in the Eastern Sierra provide visitors some of the absorbing history of mules in the development of the West. These panels tell the story of the history of Mule Days, mule packing in the Sierra, Freighting in the Eastern Sierra, Mules in Construction of the Los Angeles Aqueduct, history of mules used in developing hydro power in the Eastern Sierra, Mules in the National Park Service, Forest Service use of mules and about the American Mule Museum. Photos from collections of the Laws Museum, Eastern California Museum, Los Angeles Dept. of Water and Power, Southern California Edison Company, Mule Days, National Park Service, Forest Service, Russ and Anne Johnson, local personal family collections and memoirs were used to document the mule who made it all possible. These themes and more will be carried through in the Museum itself. 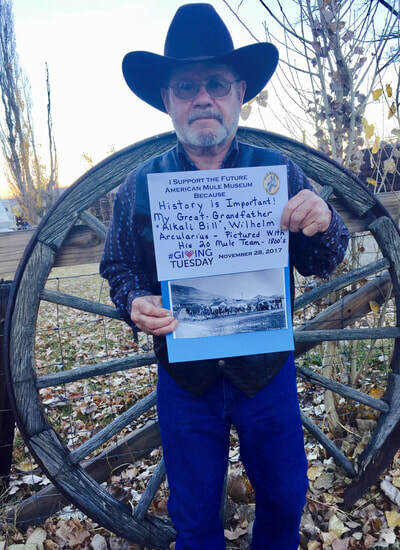 The Museum is currently planning construction of further kiosks at the Laws Railroad Museum just outside of Bishop, and the Bishop Area Chamber of Commerce located on Main Street in downtown Bishop. A grant from HUD, membership dues, donations, Alpine Signs, and hard work by the volunteers has made these projects possible. Visit these kiosk panels when you are in Bishop and learn more about the humble mule than you ever imagined. 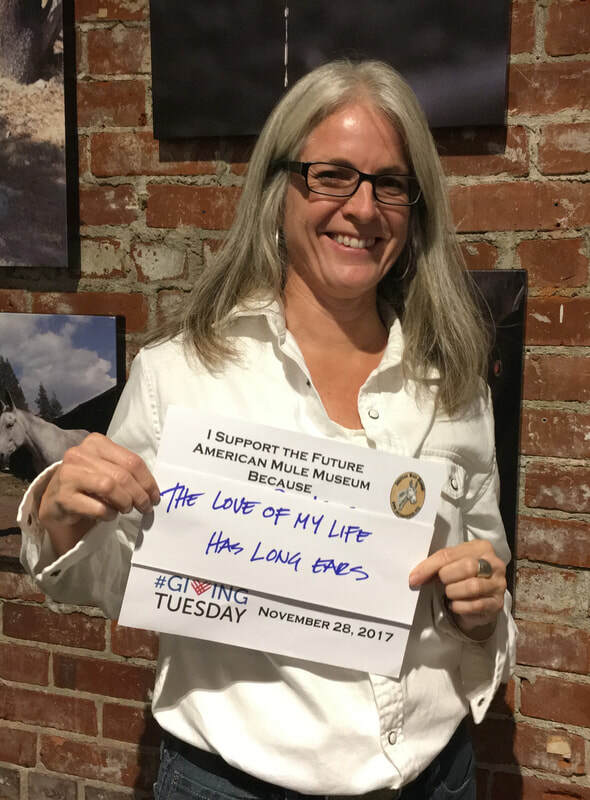 Check out the "unselfies" below from some of our donors. Click photos for larger views. A couple of months ago when we first started talking about #GivingTuesday we thought $5,000 would be a good goal to shoot for. Board president, Bob Felkel, however thought we should really go for it and have a stretch goal of $10,000. Turns out he had a pretty good sense of how generous all of you are! There are still a few checks coming in, but as of right now we have raised $11,695.50. We don't know how much matching funds we'll be getting from the Bill & Melinda Gates Foundation -- we read the matching funds were snapped up in 7 to 15 minutes -- but we're confident some of that will be coming our way (thank you, 5 a.m. donors!). So we're guesstimating the final total will be around $15,000. That is a whopping 50 percent over our audacious $10k goal! None of that would have happened without your donations and fantastic social media networking -- the number of shares and likes was extraordinary. We are so very grateful to you all. 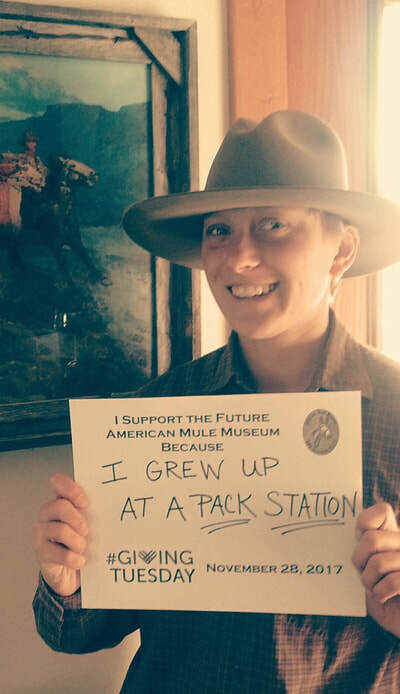 In January we hope to have some exciting news to share regarding our progress in "Telling the Story of How the West Was Built -- One Mule at a Time!" 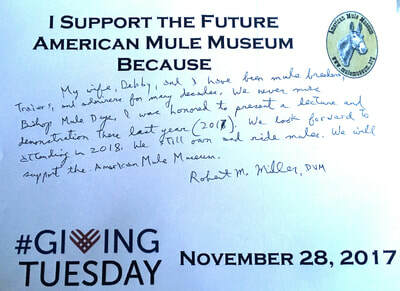 For now, though, rest assured we are working diligently behind the scenes to fulfill our mission, "to protect and preserve the legacy of the American mule for generations to come by illuminating the critical role mules played in building the American West."